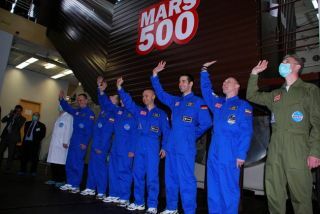 The first Mars500 crew for an initial 105-day experiment prepares to enter the isolation facility on March,31 2009. Six volunteerslocked themselves away in a network of metal tubes for the next 105 days on Tuesdayin an experiment to study the human stresses of a manned mission to Mars. FourRussians and two Europeans — a mix of cosmonauts, doctors, an engineer and an airlinepilot — shut the metal hatch behind them, sealing themselves inside a habitatat Russia?s Institute for Biomedical Problems (IBMP) in Moscow. Thethree-month endurance test is a trial run for a planned 520-day mockMars mission by the European and Russian space agencies later this year tostudy the effects of prolonged isolation on the human body and mind. ?A crewtraveling to Mars will face major challenges, not least, how to cope with beingconfined to a small space and seeing the same faces for one and a half years,? saidMartin Zell, head of the European Space Agency?s (ESA) space stationutilization department. ?It is of paramount importance to understand the psychologicaland physiological effects of long-duration confinement, to be able to preparethe crews in the best way possible and to learn about important aspects of thevehicle design.? Germanmechanical engineer Oliver Knickel and French pilot Cyrille Fournier represent Europeinside the mock Mars habitat. Cosmonauts Oleg Artemyez, Sergei Ryazansky, sportsphysiologist Alexei Shpakov and medical doctor Alexei Baranov, meanwhile, roundout the crew?s Russian contingent. The six men are the prime crew for theMars500 project, the joint European-Russian effort by ESA, the IBMP withfunding from Russia?s Federal Space Agency. ?Mars500 isthe proof that we are preparing for the future,? said Simonetta di Pippo, ESA?sdirector of human spaceflight. ? [It] is an important part of this global endeavoras it provides us with the knowledge of how to keep a small crewpsychologically and physiologically healthy, and ultimately, to succeed in thebig challenge tobring humankind to Mars and safely back to Earth.? During thenext 105 days, the six-man Mars500 crew is expected to simulate every aspect ofa Martian expedition, including a long cruise to the red planet. After a mockorbital phase, the team would then simulate a landingon the Martian surface and an excursion before another long cruise periodback to Earth. Theirhabitat, which never leaves its Moscow facility, is a series of connected, but compact,metal tanks outfitted with supplies and equipment to last the full 105-dayduration. It includes a Mars descent capsule, kitchen, medical area, researcharea and a crew compartment. Altogether,the mock Mars ship contains about 2,152 square-feet (200 square-meters) ofspace. The Mars500 crew will have voice communications with a simulated MissionControl, as well as with their family and friends. But a 20-minute time lagwill be built into the discussions to replicate the one-way transmission delaythat would be experienced in a real Martian expedition. Aseries of simulated emergencies are planned, and real-life emergencies would firstfall to the crew to solve, ESA officials said. ?They willhave to cope with simulated emergencies; they may even have real emergencies orillnesses,? ESA officials said in a statement.